In the world of formal neopagan 'Church' in which I do my work, people are often moved by the news of the day, and the distant suffering of strangers is brought to us in our hands through our media. Whether or not one supports the involvement of religious work in chosen 'causes' it is the plain goal of Wisdom to help people process our reactions to life's troubling events, and choose the best path toward better outcomes. In the Clergy Council of Our Druidry we discussed the creation of prayers and works proper to circumstances as they arise in the socio-political currents. After a few drafts this arose for me. Writing it brought me up against several bumps in my road to 'topical prayer'. I believe (not a phrase I start sentences with often) that my progressive values are simple and rational, and conform well to my polytheism, and even to many (not all!) of the tropes of ancient society. So I ought to be able to write a prayer that asks for the kind of good I want, without beginning to cite specific circumstances that I want changed. I want to write things that seek what is unarguably The Good, regardless of the times, or the circumstances of this quarter's politics, or the specifics of issues. I believe that by doing so I will advance progressive ideas, since those inhere in nature. Likewise I want the work to remain useful even after whatever current political circumstance may have inspired it has passed away. I feel the asking-for part of this verges a bit close to the recitation-of-modern-political-norms thing, but I still rather like it. May it be a blessing to the work. Let this be a prayer to the Mothers. Mighty Mothers, protect our children. Of my town and of my valley, of my mountains or plains. Let the wanderer’s children be protected as our own. 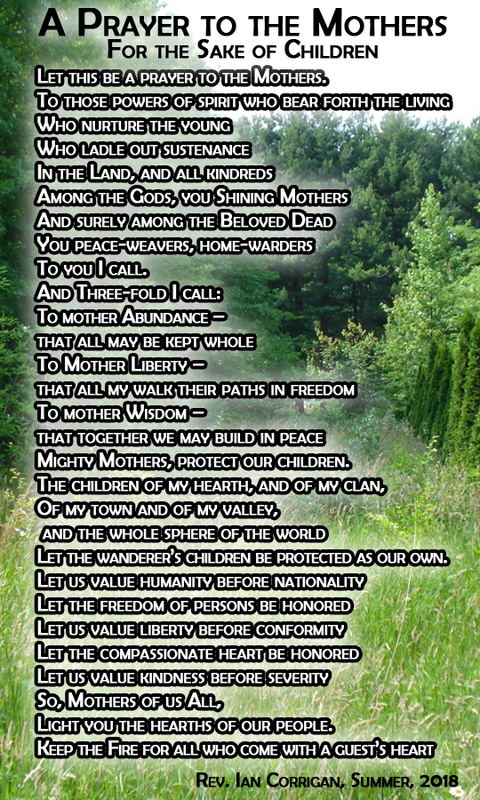 So, Mothers of us All, keep you the hearths of our people.